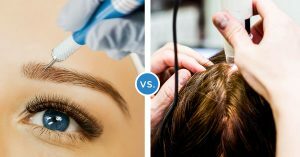 Micropigmentation vs. Microblading: What’s the Difference? There are many ways people lose hair, and there’s many types of treatments for hair loss or thinning hair. At RHRLI we offer a permanent solution for conditions like androgenetic alopecia, also known as male or female pattern hair loss, called the ARTAS® System. It’s a follicular unit extraction (FUE) which uses robotic technology to give you minimally invasive hair transplants. Some people seek other more invasive transplants, while others seek treatment to cover up thinning hair. You may have heard of treatments such as scalp micropigmentation and microblading and wonder what they’re about. At RHRLI, we want our patients to understand every aspect of hair loss. We feel ARTAS® is the best hair restoration procedure out there and it will get you back to your normal life without the pain and scarring of older procedures like follicular unit transplantation (FUT), also called strip surgery, which involves the use of scalpels and sutures. When you consult with us, we will take you through every step of your treatment. We offer micropigmentation and we want to tell you the differences between micropigmentation and microblading. Scalp micropigmentation is a method of camouflaging hair loss through the use of a cosmetic tattoo. Patients who undergo a scalp pigmentation receive a tattoo which is administered in a stippling pattern that allows them to look like closely cut hairs. Tiny needles are used to add colored pigmentation to match the look of a patient’s hair follicles. There are several reasons why you might seek scalp pigmentation. Some patients don’t have enough donor hairs to make a hair transplant procedure like ARTAS® feasible. Scalp micropigmentation is an excellent alternative. Some patients who have had previous hair transplants like FUT procedures have scarred areas and may require scalp micropigmentation. What is Microblading and How Does It Differ? According to HuffPost, microblading is a semi-permanent tattooing technique that’s used to fill in thinning or sparse eyebrows. The aim of this is treating the entire eyebrow and making them fuller. There are several differences between these techniques. According to Cosmopolitan, both techniques are semi-permanent. Micropigmentation is used on the scalp, while microblading is for the eyebrow. Microblading techniques penetrate the skin at a depth of 0.08mm to 0.15mm. Micropigmentation goes a bit deeper. Because it’s implanted deeper, micropigmentation lasts longer. Whichever technique you choose, you want to be certain that you choose to have it done by a reputable, skilled person. At RHRLI, we have one of the best permanent makeup artists in the business. Marianne Morrison is a member of the SPCP, (The Society for Permanent Cosmetic Professionals) and is fully licensed to do the procedure in New York State. She started out in television makeup working with celebrities such as Tom Cruise and Chris Rock. If you’re interested in scalp micropigmentation or if you have concerns related to hair loss and want to find out more about the ARTAS® procedure, come to RHRLI and we’ll discuss your potential treatment plans. Contact us today. Previous Post: « RHRLI Featured in GQ!